In the first half of the 19th century, Henry and Lucy Ray of Jewett City had a comfortably-sized family of five children who all grew up and survived the many natural perils and hardships of childhood that were present in colonial America. Over the course of a period of time that spanned the late 1840s to early 1850s, Henry and two of his adult sons, Lemuel and Elisha, died of a peculiar wasting away disease. Then in 1854, a third son, Henry Nelson Ray, was struck by this strange disease which today would have been identified as tuberculosis, but which back then was clearly the work of a vampire. The family exhumed the bodies of Lemuel and Elisha, and burned them right there in the graveyard. The macabre family reunion made the newspapers of the day, and due in large part to the media attention, the Ray family is known today as the Jewett City Vampires. 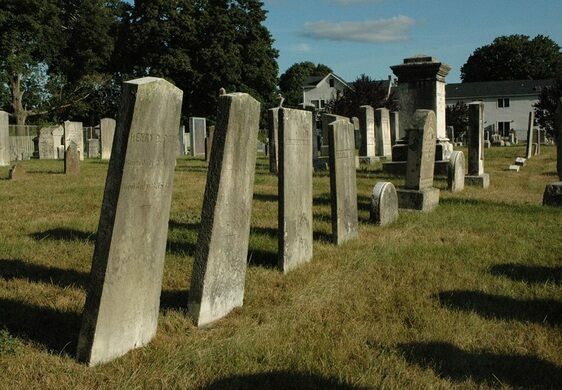 The Ray family plot can be found toward the northern end of the small graveyard known as Jewett City Cemetery, which is located at the terminus of Anthony Street in Jewett City, a borough of the town of Griswold. A line of headstones all bearing the three-letter surname now mark both the final resting places of most of the family, as well as the site of the bonfire. You can follow the timeline of events by the years incised into the grave stones. 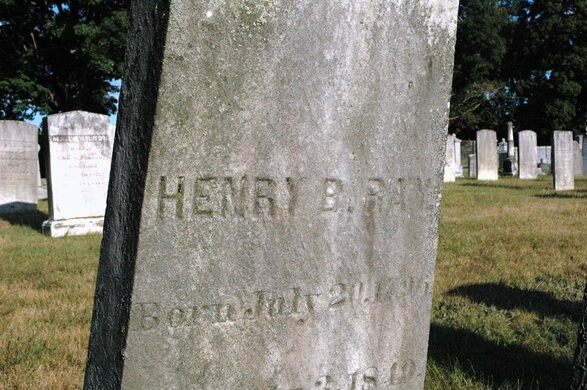 Although Henry Nelson Ray’s stone is not in the family plot, there is a gravestone with his name incised on it at the other side of the cemetery with the death date of 1854, which alludes to the possibility that the vampire hunt might not have worked, after all.